I-581 and US 220 connect together as one road that passes through the center of Virginia&apos;s Blue Ridge. It winds its way through the heart of Downtown Roanoke, connects the region to Interstate 81, and also serves as the primary road for Franklin County and Botetourt County. Many hotels are within close proximity of I-581 & US 220 and are easy to reach for travelers in the Roanoke Valley in Virginia&apos;s Blue Ridge. US 220 is a popular route used by many to connect Virginia&apos;s Blue Ridge to central North Carolina cities such as Greensboro, Winston-Salem and the Raleigh-Durham area. As such, it&apos;s also a convenient location for lodging with many different types of accommodations. 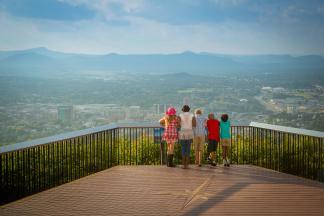 The Blue Ridge Parkway intersects with US 220 just a few miles south of Downtown Roanoke. US 220 also makes its way through the Town of Rocky Mount in Franklin County, which serves as a connecting point for the region to The Crooked Road and is also a town rich in history and culture. The accommodations in Franklin County offer all the great experiences of being in a more rural atmosphere, while also being conveniently located near the amenities and features of the City of Roanoke. North of the City of Roanoke, US 220 winds through the beautiful countryside and quaint towns of Botetourt County. Between the charming B&Bs, name-brand hotels, and unique motels, the accommodations along I-581 & US 220 offer a great opportunity for rest at the end of your Blue Ridge Day.